Melbourne, Florida is home to the Florida Institute of Technology, otherwise known as FIT. The engineering school was opened in 1958 with the purpose of supplying the space coast with the engineers, mathematicians, and scientists it so badly needed. Their school mascot is the Florida Panther. I hope to get a picture of the mural that I watched an artist paint in the summer of 2016. I had the downtown mail route then, and I was amazed to watch the mural develop on an almost daily basis. The mural displays a giant Florida Panther traveling through land, sea, sky and space. Good news for the real Florida panthers in 2018; with an on-the-road death toll dropping from 42 to 30 panthers. The State population is optimistically estimated to be no more than 320. The decrease in fatality rates is due to the state and federal governments’ installation of tall fencing, and under-road passing tunnels installed around the busiest highways in the Southwestern part of the state, where the panthers are most populated. I would love to see one of these elusive cats, but most likely never will. The Florida panther is a North American cougar. It lives in the pinelands, hardwood hammocks, and mixed swamp forests. Males can weigh up to 160 pounds and live within the rural counties of southwestern Florida. In the 1970s the population was as low as 20 panthers in the entire state. 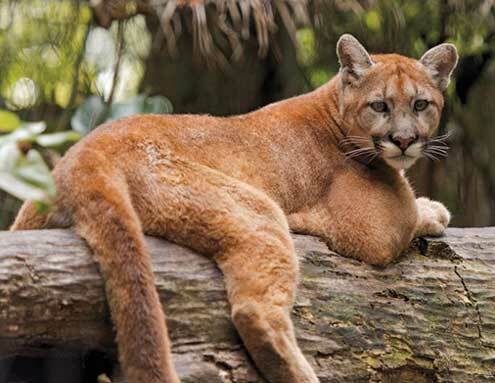 In 1982 the Florida panther was chosen as the state animal.